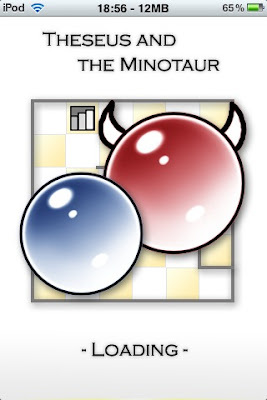 A few days ago I found Theseus and the Minotaur (Theseus, Theseus Lite non-affiliate iTunes links), an interesting puzzle for the iPod/iPhone. It is a member of the family of logic mazes. 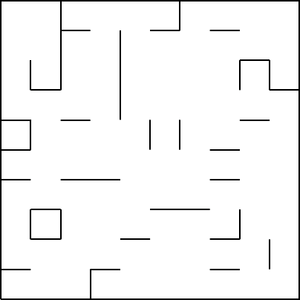 Logic mazes were invented by Robert Abbott, and the history of this interesting puzzle can be read here: 'Beyond Tetris' - Theseus and the Minotaur / Mummy Maze. In this logical maze, you are Theseus, and can move one step everywhere not blocked by a wall in every turn. You have to reach the stairs before the Minotaur kills you. The Minotaur moves twice in every turn if it can. It will always try to move closer to you, and start by moving sideways. If it can't move, it will forfeit its turn. 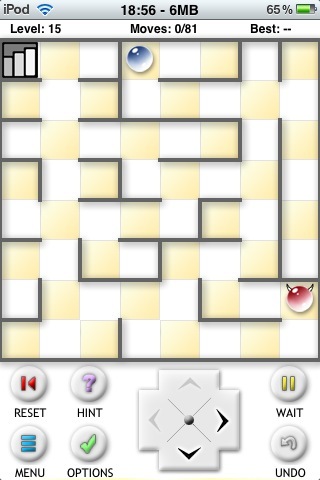 With such simple rules, you can get mazes like the one above, and harder still. I wanted to do something similar, and had one or two ideas I'd like to implement. For this, I have written a random "maze" creator. For now, it just populates a NxM matrix with integer values, representing walls, and outputs an ASCII or Postscript version of the "maze". I have quoted maze because it still does not qualify as a maze. Below you can see the output. There's still a lot of work to do for it to be useful, of course. It still has not any kind of test for closed loops or playability, it does not even place the player, enemy or end on it. I had an internal debate on which language to implement this idea (and the following parts of this, which are the real maze generator and solution testers). I was thinking of either C or LISP, and settled for C. I am more fluent programming in C, moreover I had the doubt of what the speed constraints would be... when in doubt I go on and write it in C.